Sen. Elizabeth Warren (D-MA) went after President Trump at her first campaign stop in Cedar Rapids, Iowa Sunday, speculating that the president “may not even be a free person” in 2020. In a gaggle after Iowa City event, Warren is asked about her earlier comments about Trump not being a "free" person by 2020 Election Day: "Come on, how many investigations are there now, into him? It's no longer just the Mueller investigation... These are serious investigations." However, when asked if she thought Trump should be impeached, Warren responded that the Mueller investigation needed to come out first. Should Trump be impeached? Warren says the Mueller investigation needs to come out first. Sen. Warren was mocked by President Trump when she announced her 2020 presidential bid Saturday. He joked about her past claims to Native American heritage. 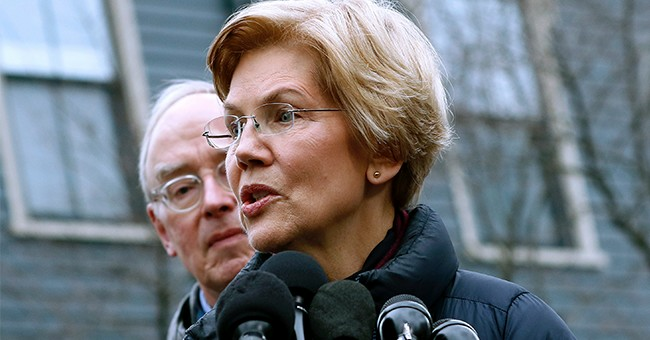 Warren was forced to apologize last week when The Washington Post revealed that she claimed Native American heritage not only at Harvard, but also when applying for the Texas State Bar in 1986. She took a DNA test last year that found she was likely 1/1,024th Native American. The Cherokee Nation took offense at her use of the DNA test to claim tribal heritage, calling it "indefensible."